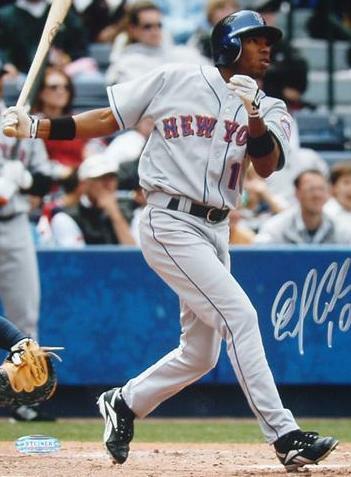 Endy DeJesus Chávez was born on February 7, 1978 in Valencia, Venezuela. 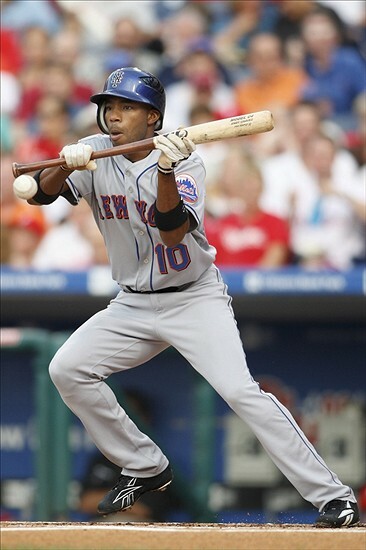 The six foot left handed hitting Chavez was originally signed by the New York Mets in 1996 as an amateur free agent. He hit over .285 in three of the four seasons he spent at in the Rookie League & the A ball level . His strange journey in the Mets organization began with him getting picked up as a Rule V player by the Kansas City Royals. He was then returned to the Mets on March 30th, 2001 but then traded back that same day to the Royals for a minor leaguer named Michael Curry. He made is MLB debut from the end of May through parts of July where he hit just .208. At the end of the season, he was placed on waivers, got picked up by the Detroit Tigers, place on waivers again then got picked back up again by the Mets then put on waivers again where the Montreal Expos picked him up. 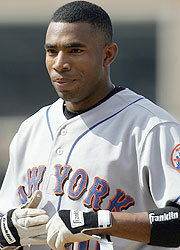 In 2002 he hit .343 with 21 stolen bases at AAA Ottawa, winning the International League batting title. He was named the Espos Minor League Player of the Year. He was called up to the Expos for 36 games that season, but had a horrible debut as he made a costly error that led to a loss to the Colorado Rockies. 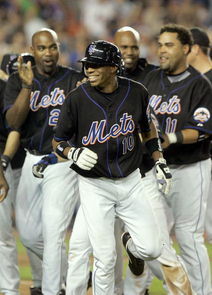 On September 21st he hit his first career HR off Pedro Astacio, getting four hits in a 6-3 loss to the New York Mets. Chavez played his first full season in 2003, batting leadoff while playing centerfield batting .251 with 25 doubles & 18 stolen bases. In the outfield he posted a .990 fielding % while making nine assists over the next two seasons. Chavez was scouted as a free swinging left hander with good speed & solid outfield play during his career. In 2004 he stole 32 bases (6th in the league) batting .277 with 20 doubles, 5 HRs & 34 RBIs playing with the Expos in their final season before moving to Washington D.C. In the final game of the teams history, which was played at Shea Stadium against the Mets, Chavez was the last batter in Expos history. He made the last out when he grounded out to Mets infielder Jeff Keppinger at second base, facing pitcher Bartolome Fortunato. In 2005 he began the year at AAA New Orleans getting to the Nationals team by early May. It was clear he wasn't in their plans & After just seven games he was traded to Philadelphia Phillies for Marlon Byrd. In Philadelphia he only hit .215 in 91 games and was released at the end of the year. 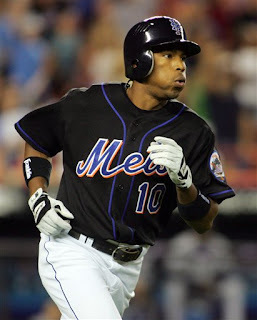 He then returned to the New York Mets signing a one year deal, for the 2006 season and out of nowhere became a very valuable role player. Chavez got to play in 133 games as an excellent utility player, seeing a lot of action for the often injured Cliff Floyd. He would also be used as a late inning defensive replacement and/or pinch hitter. He debuted for the Mets in a 14-4 win over the Washington Nationals, in the third game of the season, as a 9th inning defensive replacement in left field. Manager Willie Randolph had Chavez hit more on contact instead of for power, which raised his average to .306. Chavez was batting over .300 by early May having some big multi hit games when he got a chance to start. He had a three hit day in San Francisco on April 26th scoring two runs, and then he hit his first HR in Atlanta four days later. On May 3rd he had a four hit day in a 4-3 win over the Pittsburgh Pirates at Shea Stadium. On May 31st he was brought into a game against the Arizona Diamondbacks in the top of the 11th inning as a defensive replacement. He singled in his first at bat, and then in the bottom of the 13th he singled again, off pitcher Jason Grimsley, driving in Jose Valentin with the game winning run. On June 8th, Chavez drove in two runs with a pair of hits in Arizona in the Mets 7-1 win over the Diamondbacks. On July 4th, Chavez had a big 8th inning double off Pittsburgh’s Roberto Hernandez. The run brought the Mets to within a run, until Xavier Nady followed with a two run single, scoring Chavez with the game winning run. On July 25th he hit a three run HR off the Cubs Carlos Zambrano , although the Mets fell to Chicago 8-6. Four games later he drove in another three runs, in a big win over the Braves in Atlanta. He heated up for a hot August, where he had eight multi hit games & raised his average up to .314. In the final week of that month, he had eleven hits including a four hit, to RBI day, coming in a 11-5 win over the Philadelphia Phillies. In a September 1st game he drove in an 8th inning insurance run which turned out to be a game winner against the Houston Astros. For the season he led the team with eleven sacrifice hits, getting 108 hits overall, with 22 doubles, five triples, four HRs, 42 RBIs, 12 stolen bases & a .348 on base %. In the outfield Chavez was excellent; posting a perfect .1000 fielding %( best in the league) making no errors with nine assists. He quickly became a Shea fan favorite, always giving his all on the field while going about his business quietly with a smile on his face. 2006 Post Season- NLDS: In the 2006 NLDS against the Los Angeles Dodgers, Chavez appeared in all three games getting the start in right field in Game #2. Overall he had three hits with a run scored (3-8) good enough for a .375 average. 2006 NLCS: In the NLCS he appeared in all seven games against the St. Louis Cardinals going 5-27 with two doubles for a .185 average. 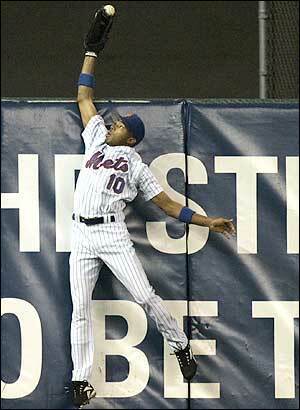 But it was on the field where Chavez had his greatest moment making one of the best catches in post season history. In the top of the 6th inning of Game #7 at Shea Stadium, with the score tied at 1-1, and a runner on first, the Cardinals Scott Rolen blasted an Oliver Perez pitch to the left field wall. Chavez jumped up, stuck his glove over the fence while in mid air, snatched the ball and made the catch. He fired the ball in to second base, where the relay throw then doubled up Jim Edmonds at first base, saving a run and the inning was over. The Catch is considered one of baseball’s best ever, certainly ranking up there with Tommie Agee & Ron Swoboda’s Mets World Series catches in 1969. The only problem was the Mets ended up losing the game, as well as the Series when Aaron Heilman served up a HR in the top of the 9th inning. 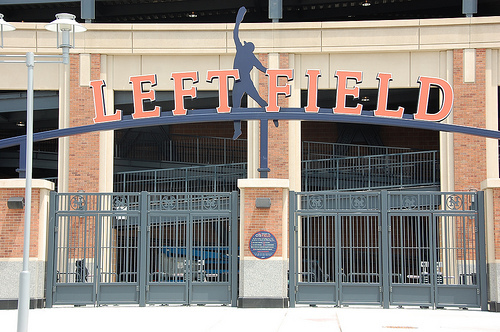 In honor of Chavez's catch, the Mets home ballpark Citi Field has a metal silhouette resembling Endy’s catch at the left field entrance. He started out 2007 with another historic game on April 24th, against the Colorado Rockies. He dragged down a perfect bunt scoring Sean Green from third base, with the Mets walk off victory. Some people still refer to the play as “the bunt”. 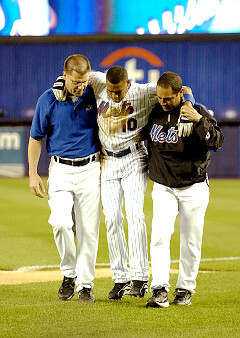 When Moises Alou went down with injury, Chavez was mostly used in left field as his replacement. 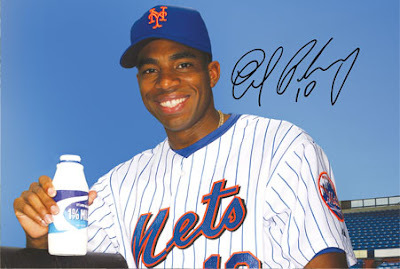 On May 18th, he led the Mets to victory over the A.L. New York club, with a two run HR off Andy Petite. He was hitting .292 when he also went down with an injury, pulling his hamstring running to first base in a June 6th Shea loss to the Phillies. He was out until late August, and the team surely missed him. When he returned the Mets had a four game lead in first place. They would surrender the lead, not making the playoffs, blowing their chances with a horrible final two weeks. Chavez finished the year batting .287 in only 71 games, with seven doubles, five steals, 17 RBIs & a .325 on base %. Once again he posted a perfect .1000 fielding % in the outfield and made three assists. In 2008 Chavez did not drive in a run until the end of May & was batting just .213 at that time. On May 28th he hit also hit his first HR of the year, as he blasted a bottom of the 9th inning HR off Florida's Kevin Gregg. He tied the game & sent it to extra innings where New York would win it. On the season he was once again a useful role player, playing in 120 games in the outfield at all three positions. That year he made the only error of his Mets career, posting a .995 fielding % with nine assists. 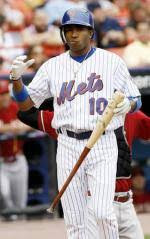 His average fell off to .267, his lowest as a Met, with one HR, ten doubles 12 RBIs & six stolen bases made in seven attempts. In three seasons with the Mets, Chavez had 17 outfield assists, making just the one error playing in 307 outfield games. In the last game ever played at Shea Stadium, Endy once again made a spectacular leaping over the wall catch. He came in as a defensive replacement in the 7th inning and robbed the Florida Marlins Jorge Cantu of an extra base hit while saving a run from scoring from second base. Once again the Mets wasted the opportunity by losing the game, this time the loss eliminated them from a wild card berth missing out on getting to the playoffs. Imagine how greater Chavez’s legacy would have been if the Mets had won both important games where he made those spectacular catches. 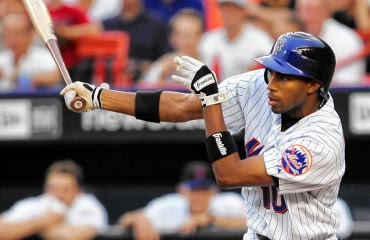 In December 2008 Chavez was traded along with Aaron Heilman to the Seattle Mariners in a 12 player deal that brought JJ Putz & Jeremy Reed to New York. He got injured in an outfield collision & played in just 54 games in Seattle batting .273 then was granted free agency at the end of the season. He signed with the Texas Rangers but missed all of 2010 due to more injuries. In 83 games with the 2011 A.L. Champion Rangers, he hit .301 with five HRs 11 doubles 27 RBIs & a .323 on base %. He played as a backup outfielder & pinch hitter. In the 2011 post season he played in five games going 0-5. In 2012 he signed on as a free agent with the Baltimore Orioles. Chaves continued to play on successful teams, as the Orioles surprised everyone getting to the post season. Endy played in 64 games as Adam Jones backup, but hit just .203 with 2 HRs & 12 RBIs. He made three appearances in the ALDS getting one at bat (0-1). In his eleven year career he has hit . 269 with 714 hits 118 doubles 32 triples 26 HRs 229 RBIs 100 stolen bases & a .309 on base %. He ranks 35th all time with a .991 fielding % in the outfield. The fine defensive player has made 55 outfield assists & 16 double plays. Chavez is the best no more arguments, he play like its his last!